The Syrian civil war, we have been told, began as part of the Arab Spring and really took hold when Syrian government forces allegedly opened fire on protesters across the country in early 2011. This pattern of indiscriminate violent behaviour against civilians has been a talking point in the western media’s regime-change narrative. The media often goes so far as to claim that the government led by Bashar al Assad has lost all legitimacy. What, then, should we make of Israel’s decision to open fire on protesters in the Gaza Strip this past week, killing over 60 protesters and wounding 2,700 more in the process? 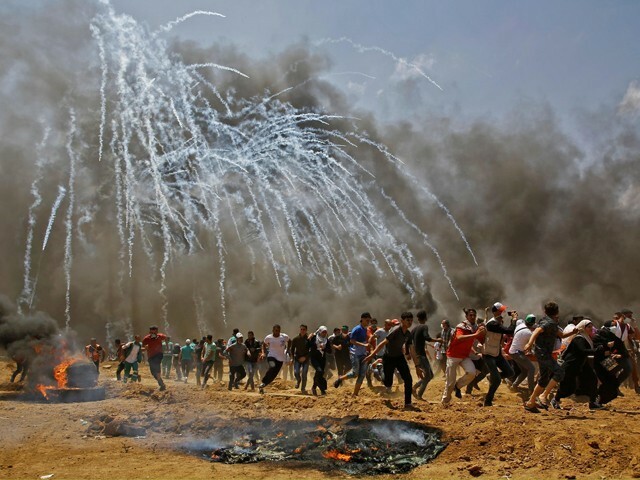 According to the US ambassador to the United Nations (UN), Israel is not an aggressor at all but a country that has shown considerable “restraint” in its use of force. Despite the claim that most of the dead were Hamas members, the fact that 2,700 people were injured suggests Israel deployed lethal force upon thousands of protesters – not exactly what comes to mind when one thinks of the word “restraint”. Even purposely shooting one unarmed protester seems to contradict everything we are supposed to believe about human rights and democracy. By that logic, Assad has also used considerable restraint. For some time, Assad’s forces have been battling groups like the Islamic State (IS), al Qaeda, and Jaish al Islam, just to name a few of the Sunni-inspired jihadists currently wreaking havoc across the country. These aren’t some ragtag bunches of rebels dreamily vying for Armageddon – they have received billions upon billions of dollars of weapons and training from the United States and an endless supply of fighters from some of the most powerful nations in the entire region. Israel, on the other hand, has been documented shooting down unarmed protesters including women, children, journalists and first responders; all the reasons we are told we should despise Assad. What could be more cowardly than shooting down people who are protesting their right to have basic human rights, who don’t have any significant armed forces of their own? For those who want to paint the people of Gaza as the real terrorists in this dilemma, consider that these people have been living in what is widely regarded as an open-air prison for years. According to an expert hydrologist, 97% of Gaza’s drinking water has been contaminated by sewage and salt. For most of last year, residents in Gaza were receiving three to four hours of electricity per day, the flow of which is controlled by Israel. On a bad day, some estimates suggest Gazans have received as little as two hours of electricity per day despite the intense heat in Gaza. In 2015, the UN predicted Gaza would become uninhabitable by 2020. The UN has acknowledged that the main reason for this impending doom is the blockade Israel has imposed on Gaza with Egypt, as well as Israel’s devastating military operations which have crippled Gaza’s economy and infrastructure. Call me an “Assad apologist” if you like, but what I am actually suggesting here is that if we were to apply the Israeli model to Assad, there would be no basis to even begin criticising Assad for something American taxpayers support just across the ditch from Syria; and further, that what Israel is doing by humanitarian standards is actually arguably worse than anything Assad could ever hope to achieve. This is not to say that Assad is not, as the Intercept‘s Mehdi Hasan wants us to remember, a “war criminal” – but, then, this is the real hypocrisy at play here: If Assad is a vile war criminal, so is the Israeli government. This post was originally shared here. Israel forces distributed leaflets informing the protesters of the consequences. Author carefully avoids talking about WHERE the electricity for Gaza comes from! There are three sources: Electricity from Israeli sources, Electricity from Egyptian sources, and from Gaza electrical generation plants using imported fuel. Due to the turf war between Hamas who run Gaza, and the Palestinian Authority which runs the left bank, the Abbas Palestinian authority has been cutting back on electrical payments to Israel to pressure Hamas, resulting in Israelis cutting back electrical supplies! That the tens of thousands of genuine protesters were not targeted by the IDF but only the determined invaders hiding among the protesters. The fact that thousands of Gazans received nonlethal injuries with only a few dozen fatalities suggests Israel deployed mostly non-lethal force. The Iran nuclear deal ngotiated by the six and approved by Obama stipulated that in case of Israel attack on non nuclear Iran, the USA will use force against Israel. This clause was not acceptable to Israel friends among the US republicans including Donald Trump, hence the deal was ended. The consiparcy being that Israel should be encouragd to stay among the semite arabs and not return to anti semite Europe. Does anyone in their right minds think US will use force on one of its staunchest allies in the region?? especially one which has its latest weapons including F 35 aircraft. Mr Obama was in right mind when he along with other five signed it. Donald Trump objected to this clause why not read the contract yourself which was published by washington post. The American administrations have proven time and again that they are not reliable in sticing to contracts. What a load of crap. The food and electricity in a prison is the responsibility of the prison guard hich is solely Israel. A bizaare explanation for the palestinians who want to go back home. are the members of Hamas resistance not humans. Have they not the rights to go back to their homes as the jews are returning to European cities? it is, that maybe you are the one who is lying. erratic, mentally unstable man. Facing impeachment, soon. The Trumpers have lost the sense for truth. People with right mind do care and are prepared to oppose the present incumbent of the white House.